Our country is famous for its open spaces. She is rich in water resources. Looking at the water surface of the sea, lake or river is to contemplate the natural beauty, power, tranquility. For many people, nothing more is required. But still very often we can see how embankments are decorated with powerful monuments, sculptures, monuments. One of such striking examples is the monument “fishermen”. Of course, it is symbolic that such a masterpiece should stand nowhere else, as on the shore near the water. The way it is. The monument “Fishermen” is located on the shore of Lake Onega in Petrozavodsk. This is a very original structure, because it is so unlike the monumental sculptures we are used to. 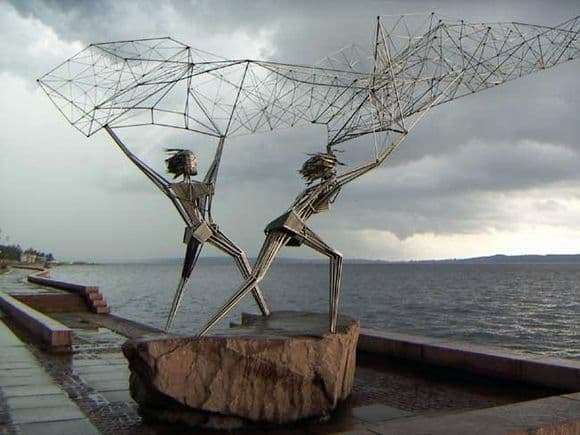 The fact is that this monument does not consist of granite, stone, but of metal rods, which in the end represent a composition of two fishermen throwing a net. The author of this masterpiece is an American. Sculpture Raphael Consuegra collected the monument in person. And all the major work on the welding of elements made the factory of the city. By the way, the monument on the embankment is not one, there is a gallery of sculptures. Locals often make fun of this “thin” structure, inventing funny, and, at times, offensive nicknames. Despite the fact that the main idea was that these two fishermen represent the work of two nations, which combine it together, the locals do not perceive this impulse. In the first years after the monument was installed, the population believed that the heroes of the monument were not held at all by a network of spy antennas. Also for the thinness of the characters they were compared with prisoners of concentration camps. Well, what to say? Our people have always been famous for a special mindset, which is not to their liking. So the idea of ​​an American sculptor did not take root in our country among a large number of residents. Although the monument itself does not constitute anything sinister and bad.